All Aboard for Cocktails, Food and Live Music!! LA Tasters and Boarding Vintage Cocktail Bar in West Hollywood are teaming up for social mixer and music. We will have a special LA Tasters’ drink menu, food, and live music starting at 9 pm. A portion of each ticket sold goes to our local food bank as well. BUY ONLINE and Get a LA Tasters’ Thank You Gift Bag! 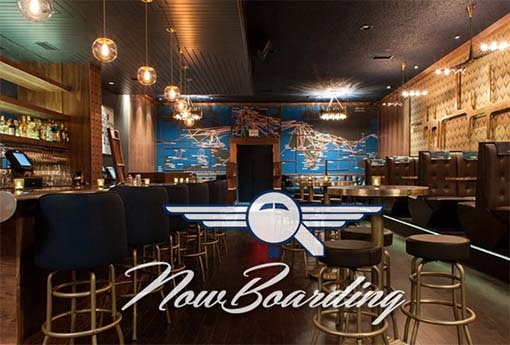 Now Boarding is a vintage cocktail bar with its roots in the golden age of air travel. Evoking the zeitgeist of ‘Catch Me If You Can’ and ‘Mad Men’, the bar delivers a First Class lounge experience without having to navigate the 405 traffic to LAX! The beverage service includes a classic cocktail list, featuring all fresh ingredients, delivered by ex-Roger Room alumni, Wil Figueroa, who is both the co-owner and managing the bar. This is complemented by a craft beer and wine list, primarily derived from Californian producers, all served by the friendliest hosts and hostesses in LA! Thank you for helping us estimate our headcount for the evening. PRICE ABOVE DOES NOT INCLUDE EVENTBRITE FEES.